The Etude (study) is particularly used by pianist composers to explore extended technique. The form has its origins in studies written to focus on a particular technique for students, but composers like Chopin and Liszt have provided a model for later generations showing how flexible and challenging the form can be. 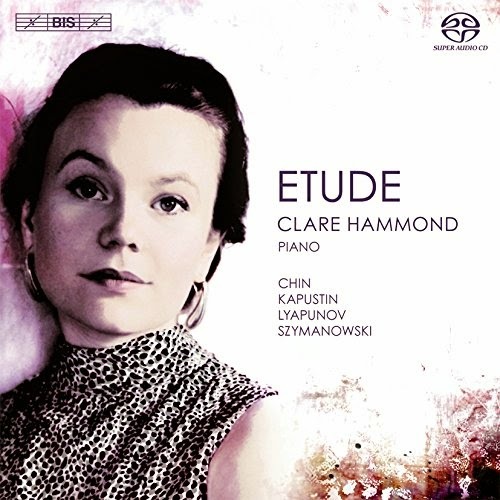 On this new disc from pianist Clare Hammond on the BIS label, she takes the Etude into the 20th and 21st centuries, with studies by the Russian composer Sergei Lyapunov (1859 - 1924), Polish composer Karol Szymanowski (1882 - 1937), Russian composer Nicolai Kapustin (born 1937) and Korean composer Unsuk Chin (born 1961). It goes without saying that these pieces challenge the pianist's technique and in her article in the CD booklet Hammond talks of how the etude combines the visceral excitement of technical display with expressive, colouristic and compositional ingenuity. She starts with three studies from Lyapunov's 12 Etudes d'execution transcendent. They are modelled on Liszt's transcendental studies but Lyapunov mixes in highly Russian colours influenced by his collecting of Russian folksongs. Etude IV: Terek (written in 1900) is named after a river which flows from Georgia into Russia. It is an impulsive piece, with cascades of notes and both delicate and bravura moments. Etude V: Nuit d'ete (written in 1900) is more lyrical and elaborate, but Lyapunov provides big romantic development. With Etude VI: Tempete (written 1897) we are back in bravura territory with robust yet romantic cascades of notes. Unsuk Chin studied with Ligeti in Hamburg and her Piano Etudes (written 1995-2003) are successors to those by Ligeti. Unlike the other composers on the disc, though a proficient pianist Unsuk Chin does not compose at the keyboard. This means part of the challenge of her Etudes is the way they push the pianists technique. Inspired by electronic music, Unsuk Chin uses layers of repeated patterns. In fact, on first listening to the pieces I was struck by their familial link to the player piano studies of Conlon Nancarrow, though Nancarrow was writing for an automatic piano rather than a human player. Etude I: in C introduces us to Unsuk Chin's sound world with open textures and a wide range, extending over the whole keyboard. The study is transparent, but quirky and though clearly fiendishly difficult, Hammond responds with clarity and bright textures. Etude II: Sequenzen starts with a low rumbling and gets faster and higher, creating an impulsive toccata-like structure which ranges over the whole piano. Etude III: Scherzo ad libitum darts and skitters about with Hammond creating pointillistic moments of colour. Etude IV: Scalen is full of light running figures, with Hammond producing a lovely crystalline textures. Frankly, it is difficult to believe that all this is created by just one pianist. Etude V: Toccata starts with a single sporadic line, which gathers fellows and the whole piece is full of repeated motifs which culminates wonderful climax. Etude VI: Grains is again pointillistic with random jabs and twinkles of sound. With 12 Studies by Karel Szymanowski (written in 1916) we return to more traditional territory. He seems to have been influenced by Debussy's etudes which were written in 1915, and Szymanwski's main concerns are colour and light. Each etude develops a particular figuration, rather than focussing on a specific technical issue, and many are bitonal. The results are a wonderfully haunting and skittish sequence of short pieces. Each one a particular colour, with a general sense of a romantic, chromatic wash pervading the movements. Melodies are often quite expressionistic in style, and the use of bitonality creates a lovely aura of harmonic uncertainty. The group finishes with Etude 12: Presto which sees the hands chasing each other about the keyboard in madcap fashion. Finally Hammond plays the Five Etudes in Different Intervals, Op.68 by Nikolai Kapustin (written in 1992). Kapustin trained as a pianist, but his style fuses classical and jazz elements. Though not a jazz composer, his technically challenging etudes include startlingly jazz-like elements. Each etude focusses on a particular interval so in Etude 1: Allegro the right hand plays almost exclusively in minor seconds (or the inversion, the major seventh). It is fast and chromatic, again with a Nancarrow-ish feel to the regularity of the motivic structures, but with jazz rhythms underlying as well. The whole feels, at times, like a demented boogie-woogie. Etude 2: Allegro concentrates on fourths and fifths, it is dark in texture but still busy with jazz and blues hints in the left hand. Etude 3: Animato is in sixths; this is a skittish movement with more transparent textures. Still very fast, Kapustin's wit comes out at the end. Etude 4: Vivace is in major second, is fast and intense with some fabulous jazz-rhythms coming out of the melee. Finally Etude 5: Animato is in octaves, the use of the octave in the right hand giving the piece a more open texture with Kapustin combining this with scalic figures. I enjoyed the Kapustin etudes very much, as he combines fiendish technique with a lovely exuberance and wit. This is a stunning disc on many levels. Clare Hammond dazzles with the extended techniques which the various pieces demand, but she also creates highly musical structures. And the programme itself is a fascinating exploration of the way composers have used the etude to extend both pianistic and compositional techniques.